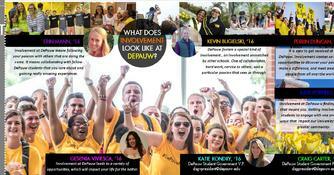 DePauw encourages students to get involved while you are on campus. There are over 100 active student organizations to choose from. Search the Student Clubs & Groups directory to see if any of them interest you. If you do not see a group that works for you, you can start your own club! The Office of Campus Campus Activities provides support for all of DePauw's student organizations and for all students interested in starting their own. Please contact us to let us know how we can assist you. 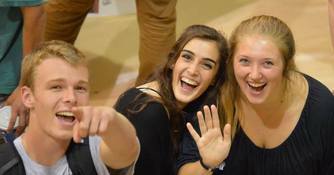 The Student Organization Showcase & Community Services Fair is the first Friday of school. Meet other students who share your interests, watch performances, and sign up for organization information/emails, etc. The Student Organizations Showcase & Community Services Fair makes it easy for you to get involved. Friday, August 25th, we are aiming to host the Student Organization Involvement & Community Service Fair. This is a great opportunity for you to meet and engage with the Class of 2021. DePauw Student Government Recognized Student organizations will have first priority in requesting tables and receiving space. We will also work with the DePauw Community Service Coordinators to provide space for our campus partners. All organizations are asked to completed this form by Friday, June 30th, 2017 at 4 PM.